The man was fired from his job at the Hawaii Emergency Management Agency last week. The agency's top official, Vern Miyagi, has since resigned. The emergency ballistic missile alert froze Hawaii for 38 minutes last month. 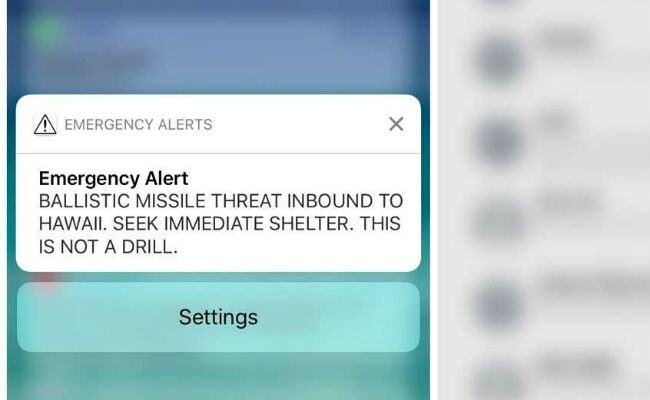 The former state employee responsible for sending out the emergency ballistic missile alert that froze the state of Hawaii for 38 minutes last month said that he felt terrible about what happened. "I feel very badly from what's happened," the man said in his first on-camera interview since the incident that was aired Friday. "The panic, the stress people felt, all the hurt and pain. I felt that myself," said the man, who was not named or shown fully during the interview with NBC's Lester Holt. The anonymous employee told NBC that he's received death threats. The man reiterated claims that officials in Hawaii released: that the worker heard "this is not a drill" at some point during the training exercise and assumed that the threat of an incoming missile was real. The incident occurred when a supervisor decided to give the arriving day-shift workers a spontaneous drill, according to a Federal Communications Commission report. The supervisor posed as a military official and played a message that warned workers of a fake threat that included the phrase "exercise," three times, as well as the "this is not a drill," language that would be used during a real alert. Officials also said the worker had not heard a portion of the exercise that repeatedly declared it was an "exercise." "I was 100 percent sure that it was the right decision, that it was real," the man said. "I'm really not to blame in this. It was a system failure and I did what I was trained to do." The missile alert went out reading, "BALLISTIC MISSILE THREAT INBOUND TO HAWAII. SEEK IMMEDIATE SHELTER. THIS IS NOT A DRILL," which caused panic and fear on the archipelago state. Officials did not correct it for an agonizing 38 minutes. An investigation released by the state described the employee as having a poor work history; other members of its staff said that they did not feel comfortable with his work. Holt asked the man, who was shown from the neck down wearing a Hawaiian shirt, whether he would do anything differently if he could go back. "I can't say I would do anything differently based on what I saw and heard," the man said.